Launched in December 2009 with 10 luxury cabins, The Heritage cruise features spacious, well-appointed cabins and suites with large ensuite marble bathrooms, a large sundeck with comfortable lounging furniture and an elegant dining room and bar. We have designed and fitted our boats to international standards while maintaining traditional Chinese Junk styling, creating the perfect balance of modern comforts and nostalgic ambiance. The Heritage cruise is a new boat with an ancient history. A true traveler of his time, the Vietnamese Emperor Khai Dinh (1885-1925) defied the custom of taking thousands of courtiers on a royal trip, and took just twelve of his most trusted followers on a very exceptional trip to Halong Bay. 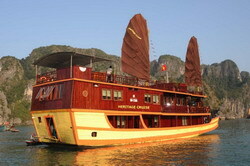 His ship was one of the best of the wonderful wooden junks that sailed the waters of Halong Bay. Inspired by the romantic landscape of the limestone karst islands rising in the middle of the waters, Khai Dinh commissioned a poem in praised of the bay’s beauty to be carved on the cliff of Dau Go Cave.